It’s the end of the world as we know it, and humanity feels fine. Or at least, it’s managing. 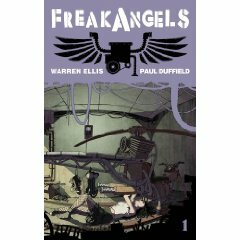 Warren Ellis’s Freakangels webcomic is set in a flooded London in the not-too-distant future, where steam powered ships and flying bicycles have replaced the Tube as people’s preferred methods of transport. The city’s inhabitants have moved upwards to the roofs of the remaining buildings still standing, and are building rooftop gardens and improvising sewage and power systems, whilst trying to fend off the occasional incursions from marauding raiders armed with harpoons. I really like Freakangels, so I may as well say this at the start of the review. It is, admittedly, a little obvious that, at the start anyway, Ellis didn’t know where he was going with this. On the other hand, the web comic form is rather well suited to this form of storytelling. The audience isn’t paying any money for its fix, so they’re more willing to be patient and go with the flow, so long as the characters and situation are interesting enough (Templar, Arizona, which we’ve also read, is another good example of this). The original premise for Freakangels was “What if the Midwich cuckoos grew up?” Fortunately, they grew up into a mixed bag of individuals with actual personalities and just the right mixture of flaws and good points (apart from the one or two villainous ones among them). Watching them interact with each other really does have the ring of truth. They might ride flying bicycles and communicate mind-to-mind, but anyone who’s ever shared a house in their twenties will instantly recognise the mixture of friendly and not-so-friendly banter over whose turn it is to do the chores, who is doing the Morning-After-Walk-Of-Shame, who needs to have a wash, thank you so very much, and who needs to stop moping around pretending to be intellectual and start doing some actual work. The whole series has a very “London” feel to it, from the flooded streets to the weekly street market in Old Spitalfields where the Freakangels pick up supplies. Duffield’s art throughout is excellent. It’s also quite realistic about the Freakangels’ role as guardians of their territory means. There’s some action-comic style heroics, but the characters are also seen struggling to find ways to deal with those among them who abuse their powers, and with their guilt over their role in the apocalypse. Both the characters and the author acknowledge that sometimes, there is no good solution to nasty moral dilemmas – but you still have to make a choice, stick to it, and deal with the consequences. Even though Ellis may not have started out with the plot mapped out, there are enough plot threads left tantalisingly dangling to keep the reader interested. The character who (we suspect) is the series’ major villain has yet to put in an appearance, but his presence is very much felt. It’s quite an interesting take on the post-apocalypse story. Instead of civilisation entirely falling to pieces, society seems to be adapting well, and there’s the suggestion that the apocalypse might actually be, if not a Good Thing, then not an entirely bad thing. Furthermore, the artwork is very nice indeed, very clear and with its own unique style. Recommended.